1. 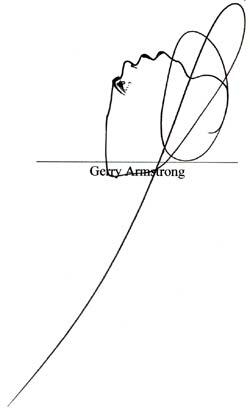 I, Gerry Armstrong, declare as follows. 2. Since the end of January 2004, I have lived with my wife Caroline Letkeman in a second floor apartment at 45950 Alexander Avenue in Chilliwack, B.C., Canada. 3. I first became aware of a man named Rene Helmer when an invitation to an open house to be held August 27, 2004 for a company called Techno-Cine [http://www.technocine.com] was left at our apartment door about a week before that date. 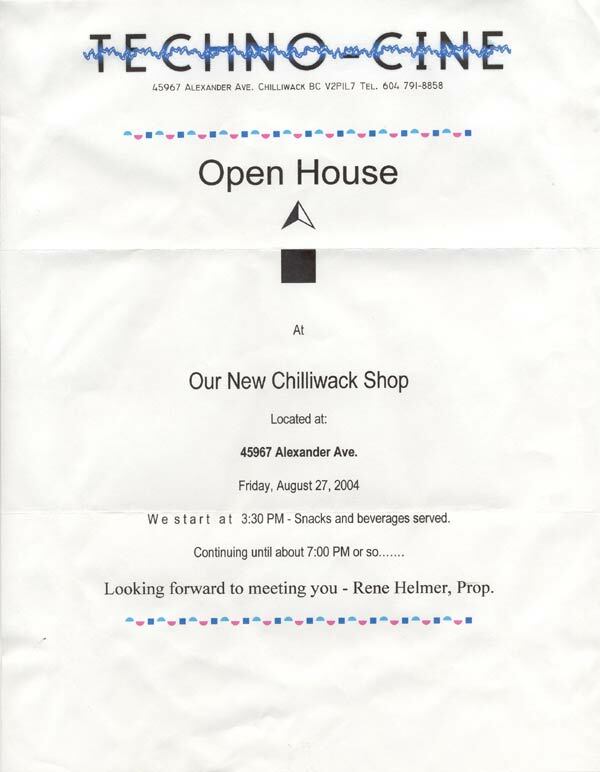 The open house invitation, a true correct copy of which is appended hereto as Exhibit A, identified Rene Helmer as Techno-Cine’s proprietor. network or service. I have been a high level target of Scientology’s intelligence personnel, as well as the organization’s leaders, lawyers and PIs for over 23 years. Caroline and I have been joint targets since 2001, shortly after we met. Being high level Scientology targets affects virtually every aspect of our lives and produces a constant awareness of threat, which we deal with as we can. We have been virtually without monetary resources throughout this period, whereas Scientology has immense sums of cash available and a global network of agents to target people like Caroline and me. We are both targets because we discovered and exposed massive Scientology fraud, organization-wide abuses, and criminal conspiracy. Scientology agents have physically assaulted me on multiple occasions, attempted several times to have me prosecuted on false criminal charges, published defamatory materials about me internationally, threatened me with assassination, sued me six times, and ruined many good things in my life utterly. area, and decided to give it a try. He said he was in movie lighting, and built elevator panels and other props. 6. Over the next months, Caroline and I encountered Mr. Helmer a number of times in the vicinity of our home. Although we had no proof then of his connection to Scientology we were always suspicious of his intentions, so we stayed friendly in our brief interactions with him, but did not encourage contact or any relationship. Caroline and I felt very vulnerable and violated, and talked about how the constant surveillance made us feel imprisoned, or like Winston and Julia in Nineteen Eighty-Four. Following Techno-Cine’s “open house,” the shop never opened, but remained closed and blacked out. 7. Some months after my first conversation with Mr. Helmer, he again rapped on our door and again I talked with him. He said that he was going to be away for some days and asked me to keep an eye on his office. He mentioned that an Owen, who rented a space a few doors away from Mr. Helmer’s office in the same building, is a good person, but that some other people in the building were not nice and were creating problems. I knew that Mr. Helmer was referring to Owen Stobbe, Caroline’s cousin, who has an auto detailing shop in the building. I told Mr. Helmer that I would keep both eyes open. This is Rene Helmer, your neighbour from across the street. I've wanted to talk to you for a couple of weeks now but we've not bumped into each other for a while. The reason for this e-mail is to let you know of my interest in the circumstances you and Caroline find yourselves in, regarding scientology. My neighbour in the next bay, Owen told me about this some months ago as, it seems, your families are acquainted. I looked into your fight with scientology, at that time, on the Internet and was quite fascinated by what I found on your web sites. You may recall that I mentioned to you once, that I have been producing and directing a TV show, called Unique Endeavours, at our local Shaw cable TV station. I've recently had thoughts on the possibility of doing a show on the unique situation that you two are involved in. Initially, my thoughts for this show ran along the lines of a David and Goliath scenario but upon looking further at elements of your web sites, I think that this project would be better served if it dealt with the effects of this conflict on yourselves, personally, and how this has affected your lives. I have a very strong interest in this matter but I'm also aware of your personal concerns for your security and privacy and I don't mean to jeopardize or to infringe on these concerns. I do feel that this subject could provide a very interesting program and I can look into other outlets for the show, in the event that it may be to "risquéé" for Shaw although I have spoken to the the Shaw Cable Manager about your storey. Please advise me of your thoughts on this idea. I would be pleased to meet you, to go over any questions or concerns you may have. You can best reach me on my cell phone at (604) 791-8858.
increased Caroline’s and my certainty that Mr. Helmer was working for the Scientology organization. Wow! Let's connect up after this weekend and talk about your ideas. Caroline and I have a full plate through Monday. We're really interested the possibilities, so we're looking forward to chatting with you. That's great! I'm busy on Monday all day and, possibly, Tuesday as well. Call me and tell me where and when. (604) 791-8858. I look forward to chatting as well. 12. After some telephone calls between Mr. Helmer and me, Caroline and I met with him at his request on August 23 in the lounge at the Rhombus Hotel in Chilliwack. We sat at a table outside on a deck beside Salish Pond, a shallow man-made acre or so of water, and we drank beer and talked for several minutes. Caroline and I had Old Yale IPA, Mr. Helmer had a couple of Coronas, I believe with a slice. He said that he had done other interviews or shoots at that spot. I suspected that Mr. Helmer had set up the meeting there so he or whoever else he was working with could secretly record us. He told us he had brought video equipment with him in case the meeting developed that way, and he showed us what appeared to be a video camera case on the floor beside him. multiple carbon copies, and they didn’t have any. He said, as if searching his memory, that they had a term for that in Scientology. I volunteered, “Making it go right,” and he said that that was it, and we all laughed. I asked him who the head of the GO in Canada was then, and he said he couldn’t remember. I asked about Ray and Hilarie Rockl, two Scientologists I’d known in Vancouver in 1969 and 1970, and who became top officials within the GO in Canada, and Mr. Helmer gave a noncommittal answer, which I didn’t ask him to clarify. The GO was the “Guardian’s Office,” Scientology’s arm that during the 1960's and 70's waged its offensive war against “enemies,” on PR, legal and intelligence channels. Shortly after present Scientology head David Miscavige took over the Guardian’s Office in the early 1980's, he restructured the unit controlling organization PR, legal and intelligence activities and incorporated it as Religious Technology Center (RTC). Miscavige holds the position in RTC of Chairman of the Board. RTC’s central control of PR, legal and intelligence activities within the entire Scientology enterprise is effectuated through the Office of Special Affairs (OSA). OSA personnel are posted in every Scientology “Church”around the world including the Vancouver organization. but didn’t have a clear memory of Mr. Helmer in the Vancouver organization at that time. 15. I asked him how far he had gotten up the “Bridge,” which is what Scientology founder L. Ron Hubbard called, and Scientologists call, the organization’s “Classification, Gradation and Awareness Chart.” The chart lists about 30 grades or levels of ability that Hubbard and the organization promised and sold to their customers. The grades or levels proceed upward from ordinary human beings or Homo sapiens, which Scientologists call “wogs,” through “Clear,” which Scientologists teach is a new superior race called “Homo novis,” to the state of “Operating Thetan” or “OT, a state of staggering intellect, super powers and total freedom. Mr. Helmer said that he had had about five or six “intensives,” which are twelve and a half hour blocks of Scientology’s “auditing,” the costly psychotherapy by which Scientologists move “up the Bridge.” Mr. Helmer thus claimed he’d had a total of about seventy-five hours of auditing, whereas, by way of comparison, I had something over a thousand hours of auditing during the 1970's. I asked him why he had left Scientology and he said that he couldn’t stand being regimented the way the organization demanded, that he’d been in the military before Scientology and had had enough of that kind of control. The impression Mr. Helmer conveyed in all he said was that his relationship with Scientology ended in the 1970's and that thereafter he had no further relationship with the organization. appeared to not understand the concept. He then said that he had been to our web site, referring to the Suppressive Person Defense League (SPDL) web site, found at http://www.suppressiveperson.org/, but said that he had not understood what it said. He appeared much more interested in the concept in Scientology that founder Hubbard called “Fair Game.” This is the principle, policies and practices governing the organization’s war on its “enemies” such as Caroline and I. Scientology has been playing a semantic game in the legal arena and in the media for almost forty years, even as it fair games its enemies, claiming that “Fair Game” was “cancelled.” My experiences with Scientology prove that Fair Game is still the way the organization prosecutes its war, and that the claimed cancellation of Fair Game is a fraud. Mr. Helmer referred to Fair Game as if it was a term he didn’t know, but which he had found on my web site as if I invented it. I told him a little bit of what I knew about the subject. decent person, and may even have been put in place because he is a decent person, and merely reports back to his handlers about his target’s movements, he has no control over what evil his handlers will do with his information. 18. Mr. Helmer said that Shaw Cable, which he had mentioned in his first e-mail message he’d talked to about Caroline’s and my story, would not be involved in the project because Scientology is too controversial. He said he had discussed us, and his human interest story idea about us with a Bruce Atkinson, the manager at Shaw in Chilliwack, and that it was Mr. Atkinson who said that Scientology is too controversial. Mr. Helmer said that he also has a contact in public relations in Edmonton with whom he discussed the project, and that this guy was interested and could be a connection to a number of media outlets. for Scientology’s policy and practice of destroying a target’s credibility, reputation, relationships, livelihood and life with the organized, broad and relentless overt and covert dissemination of defamatory material about the target. I told Mr. Helmer that the Scientologists are also still trying to get me jailed for nothing more than defending myself against their attacks and relating my religious experiences and beliefs. I explained that Scientology had filed an appeal from a judgment in California, and that oral argument in the Court of Appeal in San Francisco would be probably in late September. I said there very well may be a media flurry around the time, and suggested that perhaps the timing could be good for Mr. Helmer’s project. I said that I would send him the URLs for the legal documents I thought he should read to understand how my legal situation could relate to the project he proposed. suppress my story, and prevent it from being told at all. I am aware that my story has considerable commercial value, as well as immeasurable value as pure religious expression and as physical defense. 21. We parted with the agreement that Mr. Helmer would next contact his friend in PR in Edmonton to see what real interest there was, and would write up some questions for us to think about. The next step I would take would be to send Mr. Helmer the URLs for the legal documents I thought he should read and understand. 22. Following our meeting with Mr. Helmer, Caroline and I did an Internet Whois search for the technocine.com domain. The Whois search result, a true and correct copy of the printout of which is appended hereto as Exhibit C, gave the address of the domain registrant as 11519 - 142nd Str., Surrey, B.C. V3R 3L2, Canada. The search result also listed the administrative contact as “Philip Helmer” at the same address, with phone number 604-582-0193, and e-mail address helmerp@direct.ca. 1998, and listed as an IAS “Crusader” in “Impact” in 2000. A Sponsor is a person who donates five thousand dollars to the IAS, and a Crusader donates ten thousand dollars. One of the functions of the IAS is to fund legal and extra-legal attacks on Scientology’s victims and targets such as Caroline and I. 125 -1085 East Kent Ave.
123 - 1085 East Kent Ave. WISE is a component of the Scientology enterprise that exerts organization control in commercial companies run by Scientologists, requires fees from these companies, and uses them to spread Scientology “technology” and influence in the commercial realm. 27. An Internet search for “Ray Rockl”and “Raymond Rockl” showed that he was listed on the IAS “Honor Roll” in 1991, meaning he had donated twenty thousand dollars or had gotten twenty people to each donate to the IAS; that he did the “State of Man Congress Course” on the “Freewinds” in 1999; that he did the “Responsibility and the State of OT” on the “Freewinds” in 2000; that he did the “Command of Theta Course”and “New OT VIII - Truth Revealed” on the “Freewinds” in 2003; and that he is listed in Scientology’s webbed publication “Cornerstone Newsletter” in July 2004 as a “Cornerstone Club Member,” meaning he had donated thirty-five thousand dollars to the building fund for Scientology’s “Super Power Building” in Clearwater, Florida. 28. An Internet search for “Hilarie Rockl”showed that she was listed as an IAS “Sponsor” in 1993; that she did the “Saint Hill Special Briefing Course”at the Clearwater Scientology base in 1996; that she did the “Solo Auditor Certainty Course” in Clearwater in 1997; that she did the “State of Man Congress Course” on the “Freewinds” in 1999; that she did the “Responsibility and the State of OT” on the “Freewinds” in 2000; that she did the “Command of Theta Course” on the “Freewinds” in 2003; and that she is currently listed as the WISE “Charter Committee” representative in Vancouver, meaning she has an investigatory and supervisory role in WISE businesses. Quite a preliminary meeting! Old Yale IPA I think is the only wonder still standing out of the Big Seven. 1. 1984 LA Superior Court decision. 2. The 1986 "contract" with the cult that has been the subject of five enforcement lawsuits. 3. My respondent's brief and opposition to writ petition, both filed in the appeal Scientology took from the 2004 Marin County judgment. You should be aware of potential enforcement of the "contract" against you . And you should know what my position regarding the "contract" and my lawful rights is as stated in my two appellate briefs. I'm obviously not a lawyer, so the language is pretty simple. ----- Original Message ----- From: "Gerry Armstrong"
31. Mr. Helmer and I spoke on Sunday morning, August 28, and agreed to meet for coffee. He suggested the Starbucks shop in downtown Chilliwack, and Caroline and I met him there as he requested. After some small talk about his weekend in Victoria, B.C. and having high tea at the Empress Hotel and how much he loved it, I mentioned he’d said he wanted to get together even if briefly, and asked him what news he had. He said he’d spoken with his contact in Edmonton, who is in PR but has connections to major media, and his contact had said that the reason media weren’t touching Scientology stories, and we were having so much trouble getting our story told, was because the media is bored with anything to do with Scientology. He said something about our being concerned about why media weren’t touching Scientology stories and us wondering why, neither of which facts were true at all. I told Mr. Helmer that he may have already mentioned the name of his contact in Edmonton, but in any case could he tell me again, and he said “Ed Burton.” I confirmed with Mr. Helmer that it was Mr. Burton who said that the media were bored with Scientology, and confirmed that that was what Mr. Burton said. 32. Mr. Helmer said that what Mr. Burton and he agreed to was to make a “teaser,” not the full production but a sample of what we would say. He said that Mr. Burton would take a look at the teaser, and if he was interested he’d send a professional crew to do the show and that Mr. Helmer would be out of the picture. He said that he had a list of questions and held out a sheet of paper with a list on it. I was concerned about putting my fingerprints on the paper, but Caroline accepted the paper from him. Glancing at the questions, Caroline said they were for me, and I took the paper from her. I read the questions, and then motioned to put the list in the folder I was carrying. Mr. Helmer reached for the paper and indicated that I couldn’t keep it, but took it from me, folded it and stuck it in his dayplanner. He said that he would e-mail the questions to me, and he said that we could add any questions we wanted. though our address is known the people running Scientology still want to watch our comings and goings and still mean us harm. I said that the threat would only end when David Miscavige is sitting where Mr. Helmer was sitting. 34. He said that he had not read the legal documents I referred him to, and grimaced something about reading legal documents made him crazy. He said that his motivation was to make a little money and maybe make a name for himself. He said he had no axe to grind, seeming to imply that Caroline and I did. We parted with the understanding we’d be in touch and Mr. Helmer would send the questions. Here's the questions I promised you. Please feel free to come up with some of your own for this "teaser". As I mentioned to you, I'm out of Chilliwack for a couple of days and hope to be back Wednesday or, at the latest, Thursday. I'd like to shoot the teaser on Thursday or Friday, if that suits your schedule. I'll call you from Vancouver when I'm more sure of my schedule. What was your background prior to scientology? There’s reference to UBC. How long were you involved and what prompted you to leave that group? What were the effects of belonging to the group in relationships with your parents? What other personal costs were there? Has there been any effects regarding employment? How do you support yourselves and your activities? Do you find your Christian faith supports you through the difficulties you experience? What have been the monetary costs in your legal battles with scientology? Are there any court judgements against you in Canada? What attempts have been made on your life? Have there been any problems for you here in Chilliwack? What other security concerns do you have? Why are your names, address and telephone number posted on the Internet? Do you believe that your efforts are having an effect on scientology? What do you see yourself doing in the future? What would you be doing if not this? Do you and Caroline create and maintain your web sites? Hi folks, it's ah, Rene Helmer calling here. It's about ah, 10, almost 10:30 Wednesday morning. else out. My apologies, I try not to do this but ah give me a call soon as -- Talk to you later Bye bye. 38. Mr. Helmer and I have spoken by telephone over the past few days and have agreed to meet this afternoon at 4:00 P.M. in the Rhombus Lounge. I expect to give Mr. Helmer a copy of this declaration at that time. Executed this fifth day of September, 2005 in Chilliwack, B.C. Record last updated on 01-Apr-2005.